SpeechTrans iPhone App Review. Mobile phone are not a device to make and receive calls. The modern mobile phones is capable of doing many impossible things and here is SpeechTrans – an iPhone app that bridges the gap of language barrier. SpeechTrans German English translator is a handy translator to translate text and voice from English to German and vice versa. So,if you end up with talking with a German, SpeechTrans iPhone App helps to communicate your conversations with its voice translation feature. 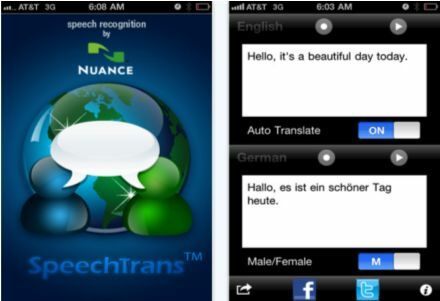 SpeechTrans App for iPhone is simple, yet powerful German English translator. The user interface of the app is simple to use with two text box to enter the English text and German text accordingly. In the auto translate mode, the entered text gets automatically translated and you can also hear the pronunciation of the translated text. Until now, all the features that I have mentioned here can be found with other translation apps. But there are still more cool features to list out. SpeechTrans has a pretty decent voice translation feature to translate English into German. With this voice translation feature, SpeechTrans for iPhone records the voice and translates it into the respective language. So at any point of time, you met a German, SpeechTrans lets you to easily make conversations. Apart from this, you can change between male and female voice using the simple slider and post your translated text directly to your Facebook or tweet about it. Overall, to my knowledge SpeechTrans iPhone App works great when compared with other translation app on the app store. Get this great app Here.